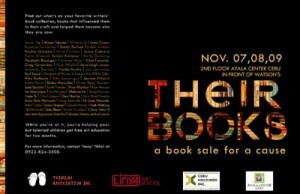 TSINELAS is now accepting book donations for the next THEIR BOOKS. THEIR BOOKS 2 will be held on the third week of September as part of the 2009 Press Freedom Week celebration. Unlike last year when most of the donors were personalities from the media, the art scene and friends of Tsinelas, THEIR BOOKS 2 will also include books donated by news sources, politicians and other prominent personalities in Cebu.